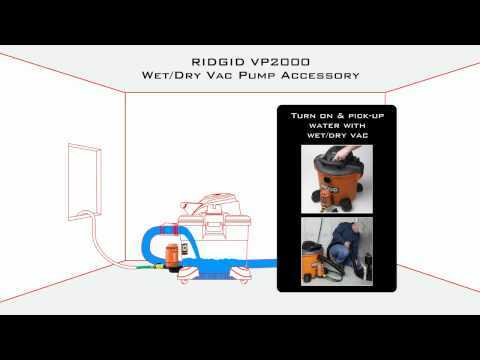 Expand your RIDGID wet dry vac's versatility with the RIDGID Vacuum Pump. If you're restoring a flooded basement, this is an ideal tool to eliminate water without transporting the vacuum up and down stairs. Install the pump on the drain port of the vac and secure a standard garden hose to the pump. Run the hose vertically and out a window for liquid disposal. The pump secures to any RIDGID vac with a drain and enables the shop vac to pump 10 gallons of water per minute up to 40 ft. high. Removes water quickly from vac, eliminating full-load transport. Attach to vac drain & 5/8" garden hose, removes 10 gal. per min. Features the RIDGID lifetime warranty. Removes water quickly from your wet/dry vacuum drum. Pumps water at 10 Gal. per minute up to 40 ft. high. Attaches to most RIDGID wet/dry vacs with a drain. Uses any standard 5/8 in. garden hose to evacuate the water. VP2000 Quick Connect Pump Accessory is rated 4.4 out of 5 by 18. Rated 5 out of 5 by Peeps from Great product! Must have accessory for your shopvac! Great item! Works great!!! Attaches easily and drains the tub of the vaccuum out quickly! It's a definite must have for any diyer or contractor!! Rated 5 out of 5 by Campdata from Easy to use Very useful tool for picking up water it saves your back from lifting the bucket. At 10 gal a min it is perfect. Rated 5 out of 5 by RayJ from Excellent product Easy to mount on the vacuum and works great! Saves my back and is worth every penny! Rated 4 out of 5 by NotHandy from Buy it A backsaver. Made getting water out of the basement much easier. I had a little trouble with the connect to the wet vac. Some leakage. More of a problem with the installer than the pump. Rated 4 out of 5 by Mikey4432 from Worth the money Ridgid has always made great products and this is one of them. Purchased to pump a small 150 gallon pond. Hooked up to my 14 gallon Ridgid shop vac and away it went. Worked great and didn't over heat. However, I do wish it pumped the water a little faster than it did. Overall a solid product. Would buy this again if need be. Rated 5 out of 5 by djmichaud from Excellent product. Works well, just a little awkward. I have purchased a lot of Rigid equipment over the years. I have never been disappointed, especially with the lifetime warranty. I have had to return a defective battery for a drill, and they stand behind it. The pump is an add-on device. The awkward portion is once the wet/dry vac is filled with water, you then turn the pump on to empty the vac's tank. In order to produce the suction necessary, the pump needs to be closed during "water pick-up". It is a two step process. Shop-Vac has a similar concept with a built in pump where the water never goes in the tank; it is PUMPED directly through the vac and into the attached garden hose. There are pros/cons to both methods. Overall, this is the better way if you plan to use your vac as an all-purpose wet and dry vacuum. This way, you are only using the pump when necessary. Rated 3 out of 5 by CTMom from With accessory motor, it is 5 stars. You really need an accessory motor which speeds up the process. With it, this works very well. Rated 5 out of 5 by MrWingnut from A real back saver. I purchased this at the same time as the 16 gal wet dry vac. its a great Idea and works well. It can also pump up out of the basement. This is a real back saver ! Rated 4 out of 5 by Topflitedude from Adequate handy pump This pump is very good for quick liquid removal from a wet/dry vacuum. Reason for purchase, I found about a inch plus of water in the basement after an unusual heavy rain storm. I must have removed close to 50 gallons of water out of my basement. The pump attached to the wet vac removed the water in a couple of hours or less. Heck, I spent more time looking for the pump running to different Home Depot stores in Gaithersburg and Germantown. In any case, apparently the pumps start flying off the shelves after rain storms in our area. A good thing I called the Germantown store and they held one of the last (2) they had in stock for me. The only complaint, which is mainly my fault is that, after using it there was sandy-like silt in the water. It quickly clogged the light duty filter. Be careful you don't have sandy like debris in the water. I might been better of with out the filter, but then it probably would have caused damage to the impeller. So on second thought, I'm glad I didn't. In any case, it's worthy of 5 stars if not for the light duty filter.